Patty: Hey there Patty Dominguez, thank you so much for joining me on this episode of Her Legacy Podcast. 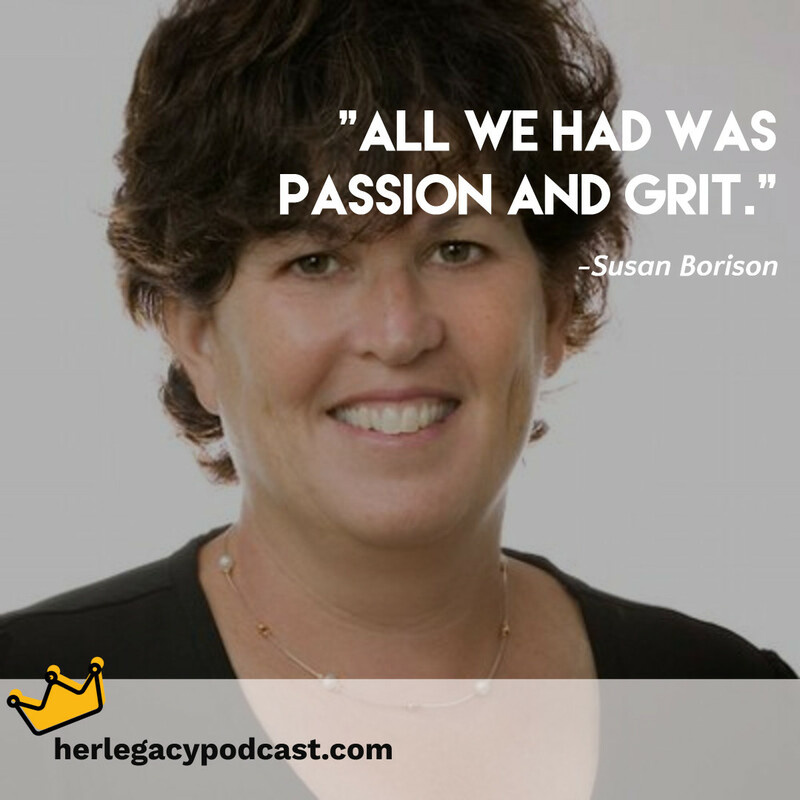 We are in episode 15 with Susan Borison and Stephanie Silverman. Two women that are moms at the time there were moms of teens and they were looking at sharing what was happening. Challenges of parenting teens and this passion project turned into something that has continued with yourteenmag.com. And I find them absolutely fascinating because of their insane amount of perseverance the way that they collaborate and they make it fun. Along the way. So these are two women that took the concept of a challenge and they turned it into a passion project. And it is truly an honor to collaborate with them as well. And so it is my great pleasure to introduce you today to Susan Borison and Stephanie Silverman from yourteenmag.com. Patty: All right well thank you so much, Susan and Stephanie, for being on our show. You are the founders of your teenmag.com and it is a pleasure to have you on. So this is a three people podcast and Susan at the beginning was saying wait wait. Who’s going to say what? And so we’re just going to riff on this. People were just going to go with the flow and talk about how do you know when it’s time to quit. And you’re going to hear from two women who have been in business with teenmag.com for the past 12 years. How’s that for tenacity. So thank you both for joining me today on Her Legacy Podcast. Susan: Thanks for having us. Patty: So I want to ask first and foremost typically I say hey let’s get braggy. What’s your superpower? But I’m speaking to an individual. But when you look at your Teen Mag what is your Teen Mag superpower in your opinion? Susan: I would say it’s just creating great content for Parents Day in and day out. Patty: Right. And you’ve been around for 12 years. What’s been the feedback around. I mean certainly the longevity that you have to create something so sustainable. How do you know that what you have to offer is great and I’m being completely honest here how do you know that? Do you get a lot of rave reviews? Susan: Yeah we just actually got something today. And it was from a reader who said. Hi there. I don’t think I’ve ever told you just how much enjoyed your teens through the years have made times that exhale. Because I found out I wasn’t alone in this situation or simply got great advice. It’s a wonderful publication. So we hear that all the time. And you know the best part about hearing it is that’s what we set out to do. Patty: Yeah that’s brilliant. And the fact is you provide community and support. And we know that when a business comes at it from a servant leadership part it just takes on a different position in people’s mind. When you think about mindshare I always think about when somebody is building a brand like what’s the mindshare that you capture. And I really see that with your teen mag. Just because I’m working on your project I see that there is just this level of comfort security for parents to feel that they’re not alone. I think that’s deeply deeply meaningful. Aside from of course that stellar content that you have so I really commend you for that because not a whole lot of people would have that level of attention to detail and care. So. Susan: Thank you. I think one of the things that we’ve tried to create is like a grownup playgroup for people and in our case it would be a virtual playgroup. But for many moms that was such a place to get information and to figure out. What was normal and what wasn’t normal and you don’t really have that anymore as your kids get older. So our goal was to create a space where you could come and you could say I have this problem and people could bolster you with their solutions or just compassion or just say me too. And. Then we have a number of spaces where that’s really happening like our Facebook groups are great for that. Really supportive it’s the village that we all look for. Patty: Exactly exactly that level of support. All right so take me back. Take us back all the way to the beginning. How did this start? How did your teenmag.com start? Susan: Well since I was there first I’ll start with that and then Steph can jump in. I have five kids. I went to law school. I stopped working after my third was born and I was fortunate enough to be able to make that decision and stay home with my kids. And when my kids when my oldest ones were getting near high school I really felt like I had to get out of their way. I had a lot of time on my hands but they did need. And I didn’t want to go back to the law. And so for years, I had been saying to my husband. Why is there no parent’s magazine for us as our kids get older? It’s not a cumulative skill set. And I lost. And I just don’t know if this behavior is normal or if I should be calling like an emergency room hospital to bring them all in. You know like you just don’t know. And how do you find out? OK, I don’t know. But I also don’t know where to go to find out without making turning everything into something extreme. And most of the things that we confront in adolescence, fortunately, aren’t that extreme but we don’t know it. So I just set out to feel the need for something I wanted and when I went and spoke to friends they wanted it to. I mean you know I had a gut that it was universal but you don’t know you could be an opinion of one. And it wasn’t the case every time I spoke to somebody they too were feeling alone and were looking for ways to kind of get validated or. You know as much as we don’t want to hear that there’s a crisis going on we’d rather know it than ignore it. So then from there we really just got a group of women Stephanie was one of them and then Stephanie and I soon after became partners. And that was the beginning of a love project really like a passion project. Patty: I think that’s so brilliant. And the first part of that. Spoken like a true entrepreneur is that we really look for solutions to problems instead of just saying oh yeah that’s a problem there. And so I’m assuming to sort of right around where 2006 or 2007. Patty: Well the conversation started in 2007 and then the magazine was launched in 2007. OK. And then the other side of it is not only the fact that you identified that there was a need in the marketplace but you also validated it by checking in with other mothers checking in with your target audience if you will as you were developing the idea you were assessing. Yeh, there is a need in the marketplace so you’ve looked at for the validation to say wow. Nobody’s filling these needs. So now it’s up to me to put something together and you rally. So I just want to give context to that because I think it’s so important. I mean ideas are plentiful. People have ideas but it’s the execution where most people fall short and they don’t really understand how to take it through to break. And so for that reason I mean that was really great that you were able to assess not only there’s an opportunity but here’s what I to do about it am. So to that point. Talk to me about the beginning of me. Did you have experience with creating an online publication? Stephanie: We had no experience as you said she was a lawyer. I was a banker. We didn’t know anything about publishing. Sue had this great idea we had met through a leadership course. I would say like every great relationship we were friends first before our work marriage and it was to this day we will say it with her credit that we really didn’t understand the media business. We didn’t even know it was called the media business, to be honest. I think what we understood was that parents seemed desperate for the same information that we were desperate for. And. I guess we just kept going. Right. Okay well, when what about this or what about that or. OK well, let’s try this and I don’t think we’ve ever been accused of. Waiting for too long. We’re both. We will take action and we just continue to plow ahead and just watch media and while we do have the business the media experience were both smart women and I think we both have that. Mindset that we’ll figure it out. We’re both puzzlers. We love to win. We really love to win. And so that just propelled us forward was just you know just keep going. Keep going and keep solving keep going and keep solving. Patty: I love that. I love that. They know right before we got a call. I was like wait. Like, let’s go live. Because Susan said we’re a 12-year startup and capturing that right. That your teenmag.com is a 12 your startup. Tell me what that means. Tell us what that means to you. Susan: I want to say that just to respond to something Stephanie said we not only did Stephanie and I not know the industry but there wasn’t one woman around the table. We were a group of women who did not know each other but someone knew someone who knew someone. And we sat around the table really working hard to get to the point of publishing our first print magazine. And no one around the table had any background so we were literally just passion. That’s all we had passion and grit. But as it turned out that was a real advantage in an industry that was changing so rapidly which is why many people told us not to do it because why would you get into media when media is you know falling apart. But we had this distinct advantage of not knowing anything so the world was our oyster like when no one ever could say we’ve always done it this way because we didn’t know we were doing so we know there was one issue. When we do this to this day but we get a cover sponsor and someone who was also in the media industry said to us like where did you get that idea from. And we were like I don’t know. We just you know we had some more real estate. And so we said well would you want to be on the cover. But that was hard for people who were born in the worlds of media because nobody did that for us. We didn’t care we didn’t know it was just a joke. Patty: I love that. I love it as an example. You made your own rules along the way and really not sticking to the conventional wisdom of what. People think it should look like. And because of that, there was an opportunity right there. So I think the curious action taking is something to be commended because. Most people would say well who can I model or. And it’s OK to model. But I think just like you said the ambiguity and you being very comfortable in it really helped you all along the entire process. So that’s pretty cool. That’s a great idea. That was I’m sure completely out of left field for somebody to say well that’s not how we do it. Patty: And then you’re probably like Oh really. And then by that time, it was a really approving concept I’m assuming right. Susan: I mean it’s worked great for us. Patty: That’s awesome. I love that but not a great story like not following conventional wisdom So, Oh my god that’s awesome. OK. So tell me now at the beginning like what were some of the myths as you put so many people are in a situation where they have a great idea with a very passionate which is what you’re saying or they have like-minded friends colleagues that turn into partners and they were allowed into this journey of saying OK we got to make this happen. It takes tenacity and we take action. And so it’s like I always say there’s just peaks and valleys through this whole journey. What were some of the like kind of crash and burn moments where you questions? Should we continue? And how did you get out of it? Susan: I’ll let Stephanie answer that but I’m just going to say that this shorter story is how many peaks were there not how many valleys. Patty: That’s so sad I might need a tissue. Stephanie: Oh yeah.No no I’ll give you the home where I really thought we were closing up shop like this. Sue knows the story I’m going to stop. So it just launched a new product. And we were things were going well with a distribution model we had partnered with an organization that was going to execute on this distribution model. Was going to be all over the country at different events. And so because the first event was close to where we are based in Cleveland Ohio is the you know let’s go to the first one let’s watch how it rolls out. You know we can always learn the server I guess or go to. So we went there and discovered that what we had agreed to with this company was not how it was taking place. So we watched you know this event unfold realized that they were not upholding their end of the bargain. And. We seize the day it’s so us. I’m looking at Sue and I can see each other while we’re sitting there having this conversation through your listeners can’t and I’m laughing because it was so us. I’m realizing maybe the theme of your team is rule breaking. So Sue and I were taking this new publication we have and we kept like breaking all the rules. You know they were told you know we could do this but we did it. They said don’t do that. Well, we did it anyway because they were not upholding our ends of the bargain. We sold advertising sponsorship that this would be distributed in a certain way. So yeah it was more like a cartoon where like you know they close one door and then the little people running around on the train coming to the other door and they try, we’re trying everything. So we get back to our hotel room that night and we realize we get a real problem here. We think rollout to you knows another 30 cities and this distribution is not working. So we’re sharing a hotel room. And we’re talking go to bed and wake up at about 5:00 in the morning I think we may see like a light. Sue was on her computer and her computer is on her lap. And we’re trying to figure out like OK what else can we do and create our own distribution method. And I thought yeah this is the day. And meanwhile, I’m appearing Sue I don’t know if you remember this part. I’m appearing on a panel maybe 48 hours later all of the entrepreneurs and you know these are like oh like why it’s so great to be an entrepreneur. And success and all these great things. Anyway, we end up figuring out a new distribution within Sue, 24 hours not even. I mean we already had a new plan and we felt good about it. We felt like well we’re so glad this happened. Now we own this distribution of this whole thing and yet we thought you know in those 12 hours or whatever it was it felt like a thousand and 12 hours that this was going to be how we went out of business like this was it It was going to be our biggest accomplishment was really looking like our biggest failure and failure is just. That is not in our playbook. Susan: I love it. I mean one of the things about a partnership that is a marriage and works there I mean we have a wonderful partnership is that there’s this. I would say that it’s you know we kind of think well neither one of us hits that point of like we should get out of this at the same time. But I don’t actually think that’s what happens. I think what happens is when one of us articulates starts to tiptoe into that space of panic the other one is the spouse who stands up and says everything’s going to be fine. Like there’s not going to be two of us panicking right now. So it’s not just me and it’s not just Stephanie but we each play that role to each other when one of us is feeling like I just don’t think we’re going to be able to pull this off. And then the other ones like oh no I had a fabulous day. And even if it’s not true even if a week later we both admit that like we were just being good to each other and bolstering each other but it really really does work. Patty:] That’s amazing. And what do you think is the reason for that is that personality types like Ying and Yang. Did you guys have core values discussion or. I mean you’ve been together for so long you just kind of find your ebb and flow but what initially was a reason that you were able to create something really like where you’re symbiotic. It sounds like. Susan: They were just too committed to succeeding at this. I mean I often look at my own marriage and I remember someone asked Pink the singer why she’s still married and she said we just don’t leave. And I thought you know in my own personal marriage I often feel like it’s a commitment to the marriage even more than a commitment to the person. And I think Stephanie and I are so competitive and so damn committed to making this. You know what it could be that you know we’re in it we’re just both in it. Patty: That’s cheating. All right so I’m going to flip the script a little bit. Susan, how would you describe Stephanie as an entrepreneur. Like what are her strengths that she brings to the table that is such a key component to your Teen Mag. Susan: I think the most amazing thing is to have divided the company in a way that we didn’t even know was the right way. It was kind of like well I’ll do this and I’ll do this. And all of a sudden like Stephanie turned into I mean I guess the word is a salesperson but it’s not that it’s so much more. It’s an ability to really understand how you partner with other people to make those relationships grow. Yep. And I was like praying that I do not violate her rule. Because I could have come out there and completely. Like beat against ourselves, you know. And we got the contract and it was insane. And that was just the beginning of this journey of like really learning a place that, I mean I think in very ironic ways where each doing what we should be doing. But we didn’t know it. Patty: And how about you. How about you Stephanie if you were to describe what Susan brings to the table those personality attributes. Stephanie: Two things come to mind. The first would be. She is a great problem solver. She can solve anything. So like there is no wall that is too tall. So like you know. She’ll get to something and. somebody quit. Somebody says we can’t do that. Somebody said it doesn’t matter what it is she’ll say OK and she’ll have it solved within like. A minute literally likes it’s crazy. It’s crazy how quickly she can go from like standing at that wall. To jumping over it around it through. Doesn’t matter does not matter. Stephanie: That you were saying get out. What is her? Yeah her superpower. She can mount large walls and circumvent them. That’s one of them. And then the other one and I already lost her. Oh, she has great ability. I mean it’s really so problems solver right to come at it from another angle that I thought. Would say well wait a minute so? If we’re trying to get. X. Maybe we should be asking this question. Oh. I don’t even think of that and it’s so funny. And this is not what you asked. It relates to maybe just how we relate to each other. Is there are so many times I just told the story yesterday to somebody or so many times where you know I mean meeting when we talking about something and somebody I don’t I will refer to. Something and I’ll say yes Sue had this awesome idea and she’ll start language like you knew that was your idea. It was so not my idea we were talking then and then we honestly cannot remember. He wasn’t. Maybe it was yours. What were very good and I always say this like. Often people call me Sue call her Steph and we make jokes with the same person and that am what you ask. Our values are very much the same. We have good marriages right. We have good relationships and we bring it into this business too But, We are very good. I would say at if we don’t agree on something. And this gets back to nothing the same person we are very good at talking it through. And one of us eventually. It’s never the same one will say you know what, you got this. You got this like this is your you know like you were excellent at like throwing something back and forth. Well, I don’t see it like that. You know what. You take it. You’re right or I don’t even know I don’t even care. You know you handle. Patty: And so here is what I’m seeing and I think is really important is that in the partnership you complement each other really well. You can recognize each other’s strengths and then at the same time it sounds to me like there’s little to no ego whatsoever. About who had the idea or who gets this or who gets to that because you know that it’s all for making your teenmag.com get better at putting out a different product. That’s very rare. Very rare. Susan: I want to say that we learned early on from somebody who turned out to be a wonderful mentor to us. That collaboration was a reality it was the most valuable thing we could do in our business. And it came at a time that was so important for me personally because I was seeing everybody else in the space that we were in as a threat. And her response was at one time said look at this like to show her the competition and she said oh my god that’s so exciting. Give them a call. And I was like. What? She’s like yes maybe you can work together. So that really changed. I think for both Stephanie and I how we run the business and so when we can’t figure out whose idea was that is the consummate compliment about a collaboration that we’ve had people work for us and it didn’t work out for them well at all because. That was a process that they couldn’t wrap your head around that at the end we weren’t going to know who got credit. That it was going to be like this brainstorming every second of every meeting where something bubbled to the top but it was a word from every single person. And at the end, it was just the right thing. I love that there are people who can’t just. I mean it’s not better or worse it’s just not the environment they work well in. Stephanie: Sue do you remember whose idea the cover sponsor was. Stephanie: No I have no idea. That’s my point. No idea, it could have been your idea, Patty. I have no idea. Patty: Well I was going to say this I remember one of the best bosses I ever worked with corporate was so great because he was all about collaboration. And I remember we had a presentation in front of our biggest client at the time is when I was in management consulting and that something had happened at home my son had to be hospitalized he was like 3 years old. And I called them up and I was Paul, I can’t make it. Like literally I have to be here. It’s you know my son is in the hospital like anybody else would be like well what are we going to do in this and that. And then it was like without hesitation he’s like, No problem. So and so we’ll pick up the ball and one of the things that I so appreciate it at the beginning of why I got that job was because we’ve worked together, we play together we win together. And if you don’t understand that I will cut you off like cancer. Like he was so militant about that one whirl. And because of that, we operated like a well-oiled machine it was probably the best situation I’ve ever been in in the tenure that I had in corporate life you know 18 years because the majority of people are all about well who gets the credit. I want to look good. It’s very self-serving. Whereas he was like he understood. Those by all of us contributing were so much stronger. Right. And we’re all going to get the accolades that we want by collaborating in that way. And that’s such a distinct Sense of leadership and emotional intelligence that literally 99 percent of people just don’t have. So that is a huge competitive advantage to you guys that I could see just from the outside looking at. So I think that’s phenomenal. Susan: OK I want another chance to give Stephanie superpowers. Susan: So the two that make. Life fun. Is that Stephanie laughs like a lot? She laughs. I mean I wish I could see what my sister in law gave my husband. But it was something about how no one thinks I’m funnier than me. So my husband in my work status. Believe that, like they both they like look at her. I mean you can see her but her whole body is involved in a lot of right things. Susan: Right. So they both find themselves very funny which of course actually does create just an atmosphere of Laughter. It does. Susan: And so that’s so much fun and cuts through any problem you ever had and then the other thing that I marvel at because I think I’m 8 years older than you right? Stephanie: I know I’m going to be 50 in March. Susan: I’m going to be 58 in April so that’s a good idea. Stephanie: There you go. We’re also good at math. Susan: Yes you’re very good at that. The thing is I cannot remember anybody’s name anymore at all. And Stephanie knows if your daughter was dating. Am and who the person was and where they went to college and they were thinking about transferring so she made a connection and she checks up on that. So if you’re going to be in sales you want to. STEPHANIE. Stephanie: Yeah I was at one. No, you don’t. Because she belongs to you. So but yeah that is a phenomenal spoke at. For a 50 sample yesterday morning Sue and I are sitting in a coffee shop already at 2 waiting for a meeting I look over the coffee shop and I think I’d recognize someone that we met with one time it’s been awhile it been a year So I’m out mother just see her, Sue look across over there. I think that’s the person and I start You know, and Sue put her glasses on and she’s looking in out first no one can see my face but she’s got this look like I’ve never seen that person before in my life right. That look and I go Oh see you’ recognize her huh. And we started. I’m like crying. Like everything is fair game. I agree with Sue says I’m going to be. If you can find any shred of something to laugh at. Count me in. Patty: That’s awesome. That’s awesome. All right so we’re turning the corner. What do you each individually excited about. Of where your teenmag.com is going. Susan: All right. Well last I think two weeks ago, Stephanie hadn’t been out of town I would have called her and said we need to meet and talk about whether there’s any way to pull this off. And two weeks later I think we are going to kill it in the biggest way. And I can’t even believe. How things have come together. Working with you. This is extraordinary. Working with the people you’re giving us which is extraordinary having. Like a man who has no reason to want to love us say he will work for us for pennies because he wants to see us succeed. I mean it’s all. There’s just all these things happening right now and they’re working they’re working. I think. You know it’s like the sky’s the limit right now. It’s really exciting and we’re never going to say it was an overnight success. Susan: It is. Hard hard work more sleepless nights than nights with sleep. And we could never pull ourselves away from this because it’s been a passion project. Patty: Well I love it. Stephanie: And the one thing I’ll add to that is and they just said this to someone the other day. That I look around the table and look around like if the players can have their hands in Your Teen right now. And it’s the right team. You know I look at every piece and my husband has a saying that when you see someone who’s. Doing the job they were meant to do it. And he always says they’re sitting in the right seat. I look around our table and I say Oh my God we’ve got every. It’s all the right seeds. And like I’ve never felt like that in the business as much as I get. Excited is I feel different times whenever I can honestly look around now and say wow like how do we get so lucky. Patty: That’s awesome. That is great. And it just shows because you were committed. You’re committed until it wasn’t until it’s convenient or until you’re tired or any of that it’s like until, until it gets to the levels of success that you that you deserve and you’re looking for so I love it. Patty: And you’re on Facebook on Instagram or you on Pinterest as well. Patty: Am I missing anything. Patty: Twitter. I always forget Twitter Twitter and now that again your teenmag.com I so appreciate your heart because both of you have such tenacity and you guys in my book are badasses so just so you know. It’s official. You are badasses. Patty: A deep compliment because most people it just won’t do what it takes to keep going so. So this was all about how do you know when it’s time to quit. Well, the answer is you don’t. You don’t when it’s a passion project and you have the right team and the synergy is there and the collaboration is there and there’s no ego in the whole thing. And I also really commend you for having a beautiful partnership that you’ve able to curates develops into something meaningful and it almost kind of crosses over doesn’t it. Between the professional and personal like were you deeply are like gosh you guys are like family right. Like that level where you look at your team and say you all are like family. We deeply care about each other. That’s when you know you hit the mark in terms of the lines are blurred in such a good way. That there’s no difference between working or bright. It’s a love that dynamic team is just jelling and it takes on a life of its own. So I see it very clearly with that you guys are developing. So thank you so much. Oh, one last question I can’t believe my famous question. The question is that each of your answers, please. When all was said and done what do you want your legacy to be? I have this great love affair like you know that I got to experience that. So I feel that way in my own life like to have this husband and these kids and these friendships and the partnership with Stephanie and all of these other people we’ve gotten to meet along the journey. It’s hard to think of something better. Patty: Wow I love that How about for you Stephanie? Stephanie: No you can’t take the words out of my mouth but I will add to that. It’s funny you are saying about being a badass. The one thing I always say is I want to be known as a kind badass. Patty: Okay. Yeah definitely. There’s a difference right about. The fact that you are a success but how you got to be a success. Right. If you like to burn bridges in the process that was the big badass. Stephanie: Yeah yeah. Now that kindness goes a long way. I hope people think about me I was about that with my kids too that they were kind. Come to teach you Steph. Patty: Gracias she’s throwing up the P sign. All right. All right ladies thank you so much for being on her legacy. Get yourteenmag.com and I so appreciate you and I think it be a good idea to come back on the podcast. Right because we’re so many good things are happening for you all and see what happened right. The 12 year starts of what’s the story of glory. We could talk about that about would be really cool. Sounds good. Susan: I think you got in steady.